Hearing about children's reading at home after we return to school following a school holiday is an important part of our classroom routine. It's something that the children look forward to because it provides an opportunity to swap recommendations and share new books that they've enjoyed, and it's something that I look forward to because I get to find out about books that may have slipped through the net. This year, hot topics of conversation included Cogheart by Peter Bunzl, the Once series by Morris Gleitzman, Wonder by RJ Palacio, and The Midnight Gang by David Walliams. We also talked about various graphic novels and picture books that had been read (mostly Star Wars and spin-offs from The Phoenix comic), and discussed the fact that these are sometimes not viewed as 'real reading' by parents because they're 'too easy' and have pictures. This lead us on to a wider discussion about what real reading actually is and about what we might read during a typical day. This reminded me of the Reading Rivers idea, which I'd heard about from Teresa Cremin, and had been meaning to try for a while. The idea was originally explored by Pamela Burnard (2002) and further developed by Gabrielle Cliff-Hodges (2010). 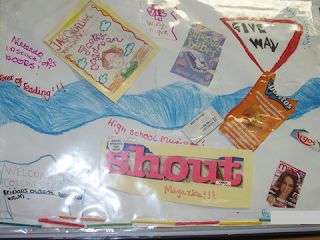 It's a visual activity where the children make a collage (which can include drawings, photos, labels, etc) of all the text types that they 'flow through' during a certain time period. 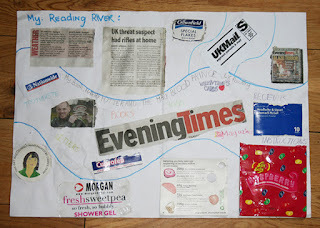 I spent some time creating my own 24-hour Reading River so that I'd be able to introduce the idea to the class. Significant poetic licence was involved, as I'd have probably run out of blue ink if I'd printed Twitter logos for every time I actually 'check in' during a day. I tried to ensure that there was a variety of media involved and that it wasn't all based around books. After showing it to the class and talking to them about each part of the river in more detail, they were enthusiastic to create their own. They decided that they wanted it to be set as an extra homework task for the week. 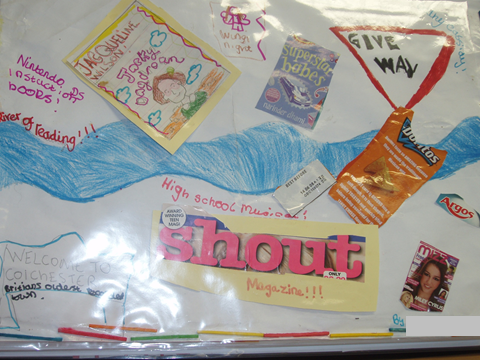 As Julie McAdam et al concluded in their 2014 project Journeys from Images to Words, the idea 'increases awareness of what it means to read and can enable children to become more confident about the role literacy plays in their daily lives'. It certainly helped me to reflect on the range of reading I do each day as an adult but it also made me more aware of the different texts that my class and their families engage with. 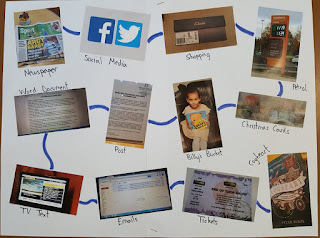 It's a simple, but useful way, for the children to connect their home and school reading, as well as providing teachers with a useful insight into the extended reading lives of their class. Next week, some of the children are going to share their Reading Rivers during assembly and talk about their reading lives outside school. We're also planning to display some of them in the school library, as well as see if we can encourage any staff or parents to have a go at creating their own.